The Republic of Albania is a mountainous Balkan nation in south eastern Europe. Sitting across the Adriatic Sea from Italy, Albania was a totalitarian state which remained isolated from modern Western culture until the 1990s. In Northern Albania, the Dinaric Alps rise to over 2,500 metres and are so remote that many villages are abandoned during the harsh winters. 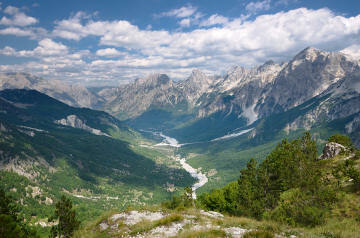 Known as the 'Accursed Mountains’, the region is home to the most southerly glaciers in Europe. Tirana, the capital, is a colourful, vibrant and noisy city, undergoing a major facelift with newly painted buildings and walkable squares. Albania’s national hero, Skanderberg, fought the Ottomans in the 15th century and is is depicted on his horse as a statue in Skanderberg Square. His name derives from Alexander the Great, who came from nearby Macedonia and fought the local Illyrians. Southern Albania shares a coastline and culture with Ionian Greece. Popular beach resorts such as Drymades are packed in the summer. The southern town of Berat was granted Unesco World Heritage status in 2008 due to its Ottoman period architecture. During the totalitarian period, British comedian Norman Wisdom became a local star as his films were almost the only Western movies shown in local cinemas. Albania’s International Airport is named 'Nene Tereza' after famous Albanian Mother Teresa., who looked after the poor of Calcutta.